It's officially summer, and one of the best ways to entertain my kids is with creativity. Making sure we have the necessary kid's painting supplies on hand makes painting activities that much easier. 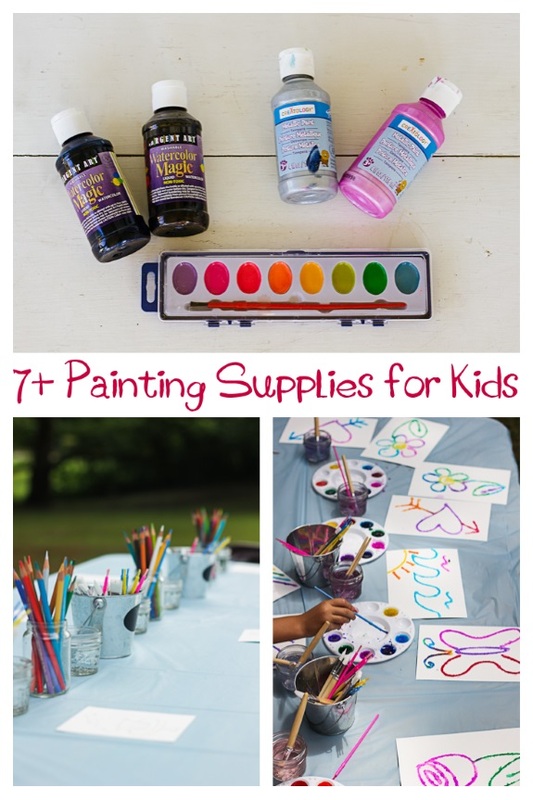 I also have a fun activity to spark your imagination with ways to use these supplies. Let's start with decent paper. These may not be fully artist quality, but they will hold up to wet paint better than your typical copy paper or construction paper and they won't break the bank. The Paint Pad and Watercolor Pad are great options. Assorted paint brushes are a must as well. The bigger the variety the better! Paints and more paints!! Again, keep a variety of styles and colors on hand. Liquid watercolors are amazing in intensity and flexibility. A little goes a long way, and diluting them with a few drops of water can stretch them even further. Have your child experiment with the effect diluting the paint has on the intensity of the color. Creatology Metallic and Glitter Paint are great for kids who like a little sparkle and shine. Anything neon is a hit around here too, so these paint palettes left over from Avery's 7th Neon Watercolor Painting Party come in handy. Paint pallets make a great avenue for painting, diluting, and mixing. Interested in exploring watercolors with a bit less mess? Try watercolor pencils. Color your image, then add water to blend and create watercolor effects. I shared this pineapple activity the other day on Instagram. By restricting the color palette and subject matter, we explored creating unique textures and patterns. A few supplies we used in addition to the paints above included dot markers and gel sticks. Need a story to stimulate creative conversation? Try Beautiful Oops by Barney Saltzberg. These words encourage flexibility and how to handle the inevitable smudges and smears that occur while playing with paint. So, how will you encourage creativity with your kids this summer? Share your favorite ideas! !